UAAP Women's Volleyball Finals: DLSU vs. ADMU Game 4 Date, Time, Live Stream, TV Info and Preview - Balita Boss! The rivalry of the Ateneo de Manila University (AdMU) and the De La Salle University (DLSU) continue as the Lady Eagles clash with the Lady Spikers in a do-or-die game for their epic final battle this weekend. The Ateneo defeated the defending champion La Salle in an epic and controversial five-set thriller Game 3 to force a winner-takes-all showdown. Ateneo survived a do-or-die match for the fourth time in women’s volleyball over rival La Salle. Lady Eagles started well winning the first two sets 25-21 and 25-23. Lady Spikers takes the next two sets 25-18 and 25-16 at the end of the fourth set to send it to a decider. Ateneo at match point, 16-15, league and DLSU best setter Kim Fajardo was called for a violation in the last play and the point was awarded to Lady Eagles to end the Game 3 of UAAP Season 76 Women’s Volleyball Finals. Newly crowned league Most Valuable Player (MVP) Alyssa Valdez top-scored for Ateneo with 22 points (19 attacks), while rookie Michelle Morente added 18 points (14 attacks). Former Rookie of the Year and MVP Ara Galang finished with a game-best 28 points (22 attacks), five blocks, and service ace to go along with 15 excellent digs. Cyd Demecillo scored 12 points and Mika Reyes added 11 for La Salle. Ateneo defeated La Salle in Game 1 in four sets 17-25, 25-23, 25-13, 25 20. Lady Eagles also made history as they ended Lady Spikers winning streak dating back to 2012. In Game 2, La Salle defeated Ateneo 25-14, 25-20, 19-25, 26-24 to move within one game of a four-peat championship. 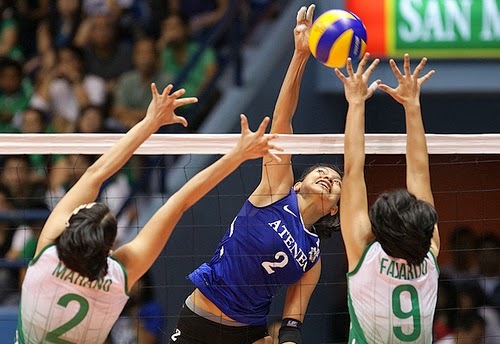 Which UAAP women’s volleyball team is better, Ateneo or La Salle? At the end of UAAP Season 76 Women’s Volleyball Finals Game 4, only one team will walk out the champions, but the one question that everyone has on their minds is who will it be?